Newly appointed Volkswagen CEO Matthias Mueller listens during a press statement after a meeting of Volkswagen's supervisory board in Wolfsburg, Germany, Friday, Sept. 25, 2015, after CEO Martin Winterkorn resigned on Wednesday amid an emissions scandal. Volkswagen plans to launch in January a recall of vehicles with software at the center of the emissions-rigging scandal and aims to fix them all by the end of next year, the company's new chief executive says. Volkswagen has said up to 11 million vehicles worldwide across several of its brands contain the diesel engine with the software used to cheat on U.S. emissions tests. CEO Matthias Mueller told the daily Frankfurter Allgemeine Zeitung: "It will hopefully be fewer, but in any case still far too many." Asked when the recall will begin, Mueller said in an interview published Wednesday that "care goes before speed." "If everything goes as planned, we can start the recall in January," he said. "All the cars should be in order by the end of 2016." Mueller said the company will have to fix the EA 189 diesel engine "in combination with various transmissions and country-specific designs. So we don't need three solutions, but thousands." Mueller said that "according to current information, a few developers interfered in the engine management." He said he doesn't think the management board made the decision to use the manipulated software. Volkswagen said after news of the scandal emerged last month that it had suspended some employees, but didn't give details. Mueller said that four have been suspended so far — among them three senior managers who at various times were responsible for engine development at Volkswagen. He didn't identify them. Volkswagen so far has set aside 6.5 billion euros ($7.3 billion) to cover the cost of recalls and other efforts to win back customers' trust. Asked if that will be enough, Mueller didn't say yes or no. "We are cautious businesspeople," he replied. "Every day brings us more clarity. Of course we will do everything so that our customers are satisfied." Mueller said he had seen that figure only in the press. "We will have to pay a fine," he was quoted as saying. "But bear in mind that there were no dead with us; our cars were and are safe." 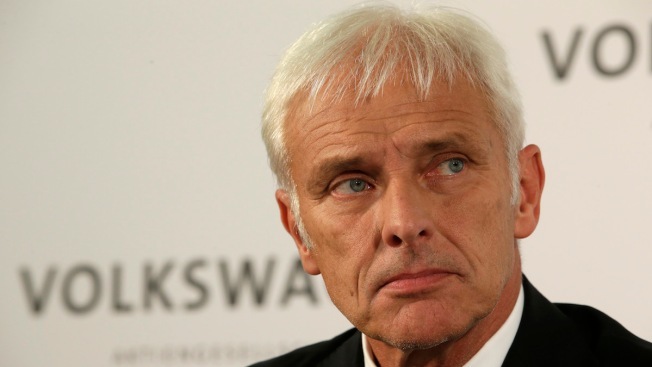 Volkswagen made a "serious mistake," he added. "We must answer for that." Asked if he would travel to America and apologize publicly, Mueller replied: "of course I am prepared in principle to do that." But, he added, "I have my hands full here in Wolfsburg at the moment." Mueller told employees at the company's Wolfsburg headquarters Tuesday that Volkswagen will have to review its investment plans. He said in Wednesday's interview, when asked if VW will give up its luxury Phaeton sedan and its Bugatti brand, that the company will "have to look at the value contributed by every model and every individual brand." "That goes for Bugatti too," he said.